If you want to be an influencer, a thought leader, perhaps you should launch a podcast. That’s how a lot of aspiring influencers think about podcasts, and that’s exactly why you should launch one, right now. The fear others have is your opportunity, because the truth is, launching a podcast isn’t that hard. Launching a good podcast is only slightly more difficult. But that’s still 1,000 times easier than launching a radio show, so the comparison really isn’t accurate. You can launch a podcast with nothing more than your laptop. You can make a much better podcast if you spend $150 on a decent microphone. Some professional podcasters never go further than this and have produced hundreds of episodes. Combine the ease of entry with the fact that a fifth of all Americans now listen to podcasts, and it’s simply too good an opportunity to pass up, either for your company or to grow your personal brand. However, one bump you’re going to face is what happens after you record the episode–the editing and posting and marketing. I could have gone with a service like Podcast Motor (haven’t ever used them, but have heard good things), but I’m looking to do a LOT of episodes for multiple podcasts (one for Influencer Inc, another for MWI, maybe more), so I chose to hire a full time podcast manager/engineer. Here are some of the questions you might want to ask during the interview process. Explain your editing process. Walk me through the exact steps you take to produce an episode from start to finish. Some might have a quick answer and run through the steps, others may have to think it through, step by step, because they might be to the point where it’s all habit and second nature to them, and they just do, they don’t think about every bit of the process. Either way, someone who knows what they’re doing will be able to walk you through the steps. Someone who is inexperienced is likely to reveal their inexperience with this first question. We aim to have a polished, smooth-flowing conversation that won’t feel heavily edited to listeners. Tell me about your experience editing out “ums,” awkward silences, voice tics, and crutch phrases? Listen for indications that your interviewee knows how to level, equalize, voice balance, and remove hisses and hums in such a manner that listeners won’t notice any abrupt changes or pauses in the broadcast version of the podcast dialogue. What kind of outside content do you have experience mixing in with a podcast interview? Ideally, a candidate will be able to give a few examples of mixing in intros and outros, sponsor messaging, and musical bumpers. The idea is to find someone who’s up to not only smoothing out the rough edges of an audio clip, but converting it into a useful, fully-branded piece of intellectual property you’re proud to share with the world. Explain to me the importance of podcast tagging, metadata, and artwork. The right answer here is that each of these elements contributes to strong SEO (which often follows different rules for podcast platforms than for Google rankings) and helps prevent your content from getting buried in the search results. You want a podcast manager who understands tagging, knows how to title the right metadata and ID3 tags for each podcast, who can also upload the appropriate artwork– and preferably who understands the nuances of ranking on multiple platforms. How do you create a high quality mp3 file? What podcast host providers do you have experience with? There are a number of places to host your podcast. A savvy candidate should have experience with Libsyn, Blubrry, or both, and may be familiar with others as well. What experience do you have publishing podcast episodes on a WordPress website? An interviewee should be familiar with setting up a feed and publishing podcast episodes in WordPress, especially if you are using a WordPress-driven blog. When launching a brand new podcast, what are some of the important considerations? Just because someone has uploaded podcast episodes in the past does not mean they know how to launch a new podcast. If you are starting from scratch, your candidate should be familiar with the initial setup processes, including configuring the PowerPress or Smart Podcast Player plug-ins and configuring WordPress to work with your podcast host (probably Libsyn or Blubrry). She or he should also know how to submit the show to podcast directories such as iTunes, Stitcher Radio, Google Play, SoundCloud, TuneIn, Podbean, and Iheartradio. (You can find more comprehensive directory lists published by podcaster Daniel Lewis and his colleagues here.) Your engineer will ideally also be aware of less technical yet practical considerations like the fact that it’s good to have a good month or two of podcasts recorded before you launch the first one, to ensure you don’t get caught in the early days without enough episodes. Do you do podcast transcription? If so, can you show me some examples of transcriptions you’ve done all by yourself. 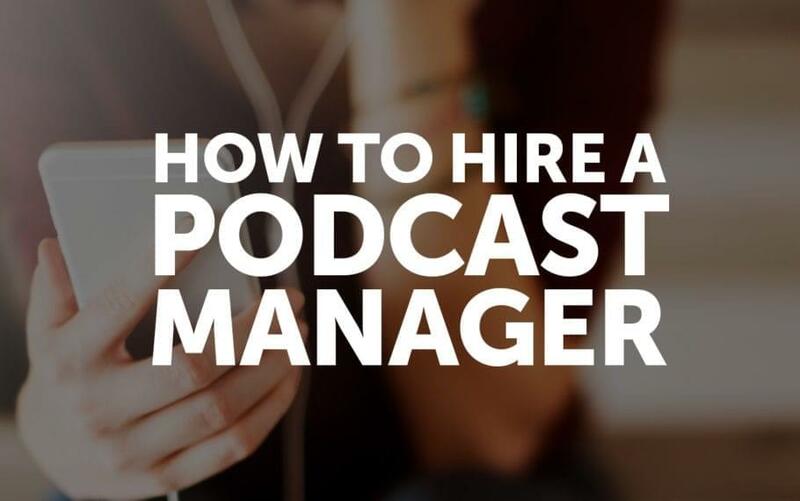 Creating professional-sounding podcasts is one thing, but transcribing them calls for an additional skillset, and to be honest, it’s unlikely your podcast manager is going to have this skill, but it doesn’t hurt to ask. Whether it’s your podcast manager or someone else who creates transcripts of podcast episodes, this is a vital part of producing a podcast because good transcripts vastly increase the reach of your podcast by making it easier for your audience to quote and share on blogs and other social media. Also, be sure you’re comfortable with how they translate funny spoken grammar into print. Can you go beyond transcription and produce quality show notes? What do you consider important to creating great show notes? Just as with transcription, it’s unlikely your podcast manager comes with writing skills to create shownotes. This is probably even a different skillset than your transcriptionist. But again, it doesn’t hurt to ask. If you want to see what great show notes look like, the best I’ve seen (and I’ve seen a lot) are from the Marketing for Owners podcast, where I was interviewed recently. How quickly can you turn around a podcast episode including show notes and transcription when the audio files are submitted? What software do you feel is best for doing podcast interviews? Get a feel for the technology your candidate likes to use (Skype or Zencastr, for example). If you have a favorite software, make sure both of you are comfortable using it–this is an area where it’s critical for both of you to be on the same page. What type of equipment would you suggest someone use to launch a podcast? Podcasting equipment, like most things, often comes down to a compromise between quality and budget. You should research your options and pricing for items such as recording devices, microphone headsets, mixers, pop filters, and soundproofing. Make sure your podcast manager has an opinion on what constitutes ‘good’–and that you can both live with your available equipment budget. What sort of marketing have you done in the past to promote recorded episodes? How do you think you would go about it here? This is one of the most crucial questions you can ask, because the whole point of a podcast is to expand your reach and strengthen your brand–neither of which will happen until people know about your show. Promote your episode on one or two social platforms (Facebook, Twitter, LinkedIn, Instagram, &c.) where you know your listeners are on and use a scheduling tool like Hootsuite or MeetEdgar to start promoting your show. Ensure you tweet episodes with SoundCloud linked so that they can be played from within the Twitter stream (subject to change, given that we don’t know if SoundCloud will be around much longer). Post an Instagram picture for each episode AND include the top trending hashtag that day (found on Instagram homepage dashboard), along with 5-10 hashtags relevant to that episode. Also, tag 5 specific people who would get value from listening to the episode. Use Spreaker or another podcasting service that can be connected to your YouTube account. Seek out forums on subjects similar to your podcast and join in on the conversation. Drive traffic to the podcast via Reddit. Create sponsorship partnerships with affiliates in exchange for free ad space. Create a handle on Twitter and drive traffic using an auto-follow system (though, this comes with caveats). Share episodes in relevant Facebook and LinkedIn groups. Send episodes to influencers who you know are very interested in a particular topic with the hope that they’d enjoy and potentially share. Google “best [your niche] podcasts,” and create a spreadsheet listing every single post you can find that your podcast is not a part of but should be. Then, send a simple email to the blog owners asking if they would add your show to the list. Include a link to your podcast on your Amazon profile. If your podcast manager candidate breezes through these questions and has a few good samples, you’ve got a winner on your hands. What other questions would you ask in an interview? Leave a comment and let me know! Special thanks to Jay Kim of the Jay Kim Show for contributing to this post, along with Andrew Pasaporte, the podcast manager I ended up hiring using these very questions.